Discover central Portugal from this luxurious apartment! Located at only 50 meters from the coastline, between Porto and Lisbon, this accommodation has the ideal location to explore beautiful Portugal! 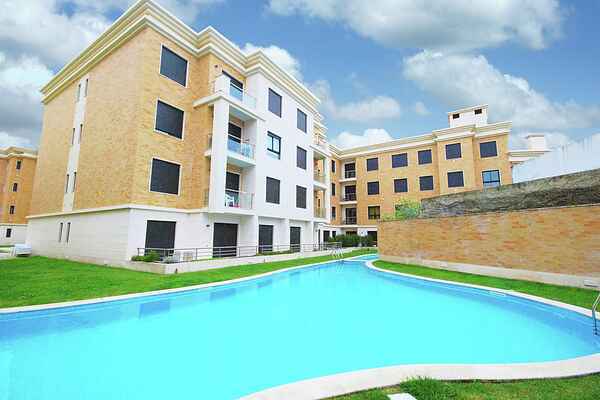 This comfortable and well equipped apartment on the 2nd floor is situated in a modern apartment complex, down town centre São Martinho do Porto. The balcony with chairs offers you great outdoor relaxing offers. Like swimming? You’ve come to the right place! The complex has a large communal swimming pool n the shielded garden, and you are within 1 minute at the beautiful beach. You won’t lack any comfort in this apartment with all modern facilities and ideal for families. Here, far away from the big cities, but close enough to be able to pay them a visit, you can totally relax in the shell formed bay of São Martinho do Porto on the Portuguese Silver coast. The bay is a well known holiday resort for the Portuguese, and hasn’t yet been discovered by the mass. The fishermen’s beach of Praia da Nazaré is just a 10 minute drive away. The centre of the friendly village of São Martinho do Porto has many fish restaurants, where you can enjoy a delicious fresh fish meal. The town is surrounded by hills, where you can go for lovely walks. If a cosy atmosphere, mixed with some couleur locale is what you’re looking for, you’ll definitely feel at home at the Costa de Lisboa. Gorgeous golf courses can be found in the surrounding area such as Bom Successo (22km) and Praia del Rey (20km), but culture lovers will find a way to entertain themselves as well. Pay a visit to the medieval Óbidos or the monastery of Alcobaça at 20km distance!